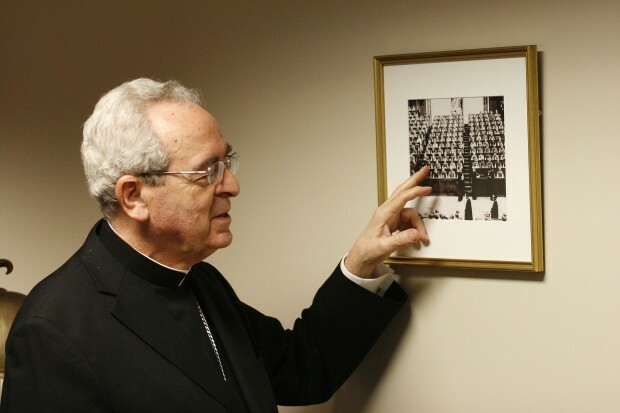 KNOXVILLE, Tenn. (CNS) — Cardinal Justin Rigali, former archbishop of Philadelphia and St. Louis who is currently in residence in Knoxville, was a priest assistant at the Second Vatican Council — a spot that essentially gave him a backstage pass. The significance wasn't lost on the then-27-year-old Los Angeles priest, who called it a privilege to play a minor role at the council. The experience shaped his career of more than 50 years as a priest, bishop, archbishop and cardinal who has worked closely with Popes Paul VI, John Paul I and John Paul II. He participated in the election of Pope Benedict XVI as a member of the College of Cardinals and continues to serve on two Vatican congregations. He is a member of the Vatican Congregation for Bishops and the Congregation for Divine Worship and the Discipline of the Sacraments. “Yes, it was a privilege to play a minor role in Vatican II. But it was an immense personal enrichment that brings with it everlasting memories and also a sense of having heard what went on and having seen how seriously the bishops worked under the inspiration of the Holy Spirit,” Cardinal Rigali said. He vividly recalled 2,500 bishops from around the world filing into St. Peter's Basilica in procession on Oct. 11, 1962, closely followed by Pope John XXIII, to open the council, which concluded Dec. 8, 1965. The priest worked closely with the bishops and cardinals in attendance, a list that reads like a Who's Who among Catholic leaders. A young priest named Father Joseph Ratzinger served as a theological consultant and would later become Pope Benedict XVI. Archbishop Karol Wojtyla of Krakow, Poland, took part; he would become Pope John Paul II. Also in attendance were the future Pope Paul VI, Milan Cardinal Giovanni Battista Montini, and Bishop Albino Luciani, the future Pope John Paul I. They were joined by Bishop Fulton Sheen and Cardinal Francis Spellman. “In other words, Vatican II was there with the teaching of the bishops and the pope to emphasize once again everything that we believe,” Cardinal Rigali told The East Tennessee Catholic, newspaper of the Knoxville Diocese. He believes the most important development to come from the council was the Dogmatic Constitution on the Church (“Lumen Gentium”), because it delved into the nature of the church as the people of God, the mystical body of Christ. It also treated Mary as the mother of the church and addressed the men and women religious of the church, the laity, as well as the clergy. The council consisted of four sessions, approximately three months each. Father Rigali attended two of the four sessions before he accepted another assignment at the Vatican. Since he spent much of his priesthood studying Vatican II, he wants Catholics to understand that Christ's teaching was not altered, just re-emphasized, and important changes took place in the way Mass could be celebrated. He described the council as an immense amount of work with many people helping to prepare drafts of each document. The cardinal said the implementation of ideas from Vatican II has taken much time and effort over the years and still is occurring. He takes issue with those who weren't at the council and have not read the documents but interpret “the spirit” of the council as being able to do anything you want. He said the council's documents are still relevant today, particularly the document on religious freedom. When asked if there would be a Vatican III, the cardinal was not sure. He said the growth of the church around the world during the past 50 years has made the logistics of holding such an ecumenical gathering much more complex and also greatly improved communications reduces the need for the world's bishops to gather at one place at one time. He also noted that smaller groups of bishops meet at the Vatican in synods. “You just don't have a council to get together and write 16 documents and then just say well, it's been a while now and we have to have another council to write more. No, the council takes time to apply. And that's what we're still in the process of doing,” he said. Brewer is editor of The East Tennessee Catholic, newspaper of the Knoxville Diocese.